I had a prom gown like yours…well covered. Yes, shopping is hard. I am a smaller woman and it is difficult to find mature (not matronly) clothes. If only I could design, I would make a line for our age. I have often thought I wish I had the capital and expertise to run a store. If I did, I would market directly to middle aged women who want to look nice, not matronly, and not wearing the same clothes the teenagers are wearing. Also they would be comfortable and without sequins! Interesting article. I like the title too, but misunderstood it. When I saw the picture of the horse I was time-warped back to my youth, when housewives would rush out into the street equipped with buckets and shovels when the rag-and-bone man (and his horse) had gone by – to collect free manure for their roses. Hi Ann, Prince is very beautiful. I can imagine how you miss him. I didn’t realise WordPress could do that. I haven’t been blogging for long and only knew to select one photo, plonk it in, and that was that. Shopping is definitely no longer fun. Most stores seem to cater to either those way younger than us or much older. As for signing up for loyalty cards, how about just giving me a discount because I shopped there and not because I have a card. I refuse to sign up cards anymore, I just say, I am not interested and if they try to convince me that I will get so many deals, I leave everything and walk away. I agree! I don’t want to sign up for cards which track my every purchase, and which are obsolete within a year, when a whole new “loyalty program” is rolled out. Just be glad we are shopping at your store in the first place! Oh the joys of muddling through middle age…. 🙂 It’s all good though – right? we now know what really matters and what is important. and it’s not a whole Saturday at the mall like we all loved to do a couple hundred years ago – haha! Yes, at least a couple of hundred years ago when we spent our Saturdays at the mall, I think! But middle age certainly has its up side as well, thank goodness! Wasn’t it though? Sometimes I wish there were occasions when I had the good sense not to have my picture taken…. I hate shopping also, mostly because I want to be doing other things. But tell me about the horse?? That’s a picture of Prince, a horse I had for many years. Why it got inserted into my blog (on the Reader section only, thank goodness) I have no idea! Someone else made a comment about the horse photo, and I thought they were commenting on the wrong person’s blog. I’m so glad you said something, so I knew it was there. WordPress will be the death of me yet. They have inserted random photos from my media library into my blogs before (again, shown only on the reader section), but I thought I had figured out how to stop that. Apparently, I hadn’t. I guess I’ll have to write my next post about Prince, and see if they put the photo of the prom dress in that one! I don’t enjoy shopping either. If I like the style, the fabric is horrible. If I like the fabric, the style isn’t geared to what I want to wear. Anything I do like, I would have to avoid eating for years just to fit into it. Then I have to deal with being short. I can’t win! Exactly!!! Shopping is so frustrating, and very hard on the ego, too! I enjoyed your post, although I’ve never really been bothered about shopping for clothes myself, so there’s no change there. I actually quite liked your prom outfit. I realize, though, that fashions change. I’m not sure when the photograph was taken, but it looks like the very early 1970s. If so, I was a young boy with a hairstyle that made me look like a walking button mushroom. In comparison, your dress really is very much better. 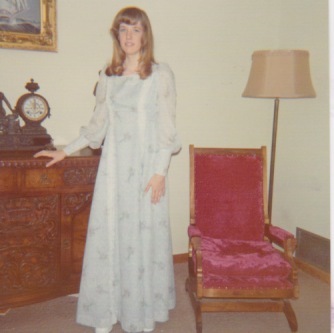 It was taken in 1975, I think, and the floral material and puffy sleeves were in style at the time. At the time, I thought it was very pretty, and I suspect that in thirty years (if I’m lucky enough to still be around), I’ll be judging the clothes I’m wearing now a bit harshly. You’re right: styles just change! I sometimes find shopping for clothes in stores frustrating–but I find shopping for clothes online even more frustrating since I end up needing to return a very high percentage of online purchases. You are so right, because how can you tell if something is going to fit unless you try it on? Thanks for the comment! Got a big kick out of this one. You are so right about the department stores (we mean the old Famous Barr, now May, right?) being crammed with so much stuff. Your description of the dressing rooms was perfect. Yes, I was describing Macy’s in this post, but honestly, the other department stores I visit are just as bad! I don’t know why the stores have declined so much, especially now that they are getting so much competition from on-line retail sites. You would think that they would be trying to make the actual shopping experience a pleasant one, but that doesn’t seem to be the case.